The National Catholic Register just posted a kind review of the book my wife and I wrote, “The Catholics Next Door: Adventures in Imperfect Living” (Servant 2012). Reviewer Nick Manetto called it “A Catholic-Style Dose of Reality,” which is a pretty accurate summation not only of the book, but how we should handle all of our transactions and interactions with others. When we produced the Rosary Army Catholic Podcast (the archive of which is still popular on iTunes), so many listeners branded it the world’s first Catholic reality show that we actually appropriated that tagline into the opening credits of some of our later shows. In a gluttonous world that can’t get enough of reality shows, the idea of being real has become abhorrent to some. Some people see reality — or just being transparent, open, and honest — as a sign of weakness waiting to be exploited. And many have tried to exploit desire to be open and honest for their own gain. I look at it this way. Living my life honestly, by often (but not always) throwing all my cards on the table for all to see, not only allows me to live my life in an upfront and responsible way, but it also more easily draws out the negative personalities of those who wish to exploit that honesty, as well as the positive personalities of others who have similar mindsets and goals in life. And for me, that’s a quick way of knowing who the people are in my life that I want to work with, and to have a clear knowledge of the people I want to avoid. Greg, Interesting and inspiring blog post. 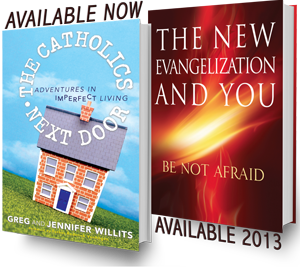 Looking forward to reading your new book on the New Evangelization when it is released in Spring 2013. May God continue to bless you, your family, and your ministry.